Dimensions (HxWxD): 16.25"x 12"x 17.5"
The Swingline stack and shred 100M auto feed shredder eliminates the need to manually feed papers to the shredder. It allows you to work on other tasks while the 100M auto feed shredder automatically shreds 100 sheets of paper with paper clips and staples into small micro cut size of 1/8”x1/2”. The Swingline 100M shredder delivers level 4 (P-5) high security that is suitable for destroying high security documents into pieces that cannot be put back together. It shred a single sheet of paper into 2000 pieces that fall into a 7-gallon waste bin. The 100M auto feed shredder is built with a manual shredding slot that shreds up to 6 glossy papers and crumpled or folded sheets. Credit cards are also shredded manually. 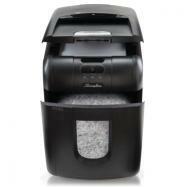 It delivers ultra quiet shredding operation and is an ideal paper shredder for busy workplaces. Meant for use by 1-2 users. 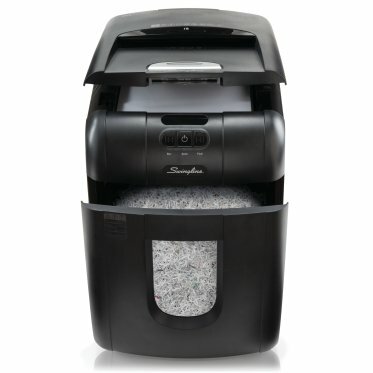 The Swingline 100M shredder has multiple functions that simplify shredding. It includes Intelligent Power Save function and automatic wake up saving on power consumption. Moreover, the 100M auto feed shredder also has self cleaning cutters that make sure the shredding is not compromised and is free of any paper jams. The Swingline stack and shred 100M auto feed shredder is an Intelligent Auto+Jam clearance paper shredder that not only makes your task easy by shredding large quantity of papers automatically but in fact will also deliver uninterrupted operations. Shred up to 100 legal and letter size sheets automatically and 7 sheets manually in one cycle. Illuminated status symbol to keep the user updated on the current status of the shredder. Integrated Intelligent Power Save and Automatic Wake Up. Consists of a full bin indicator.